We’ve talked a lot on this blog about some of the common ways pumas get killed in the Santa Cruz Mountains. Most of the time, adult pumas die due to something human related (e.g., by being shot or hit with a car). Sometimes, pumas will also be killed by male pumas either in territorial disputes (e.g., male on male violence) or for some other unknown reason (e.g., when females are killed). 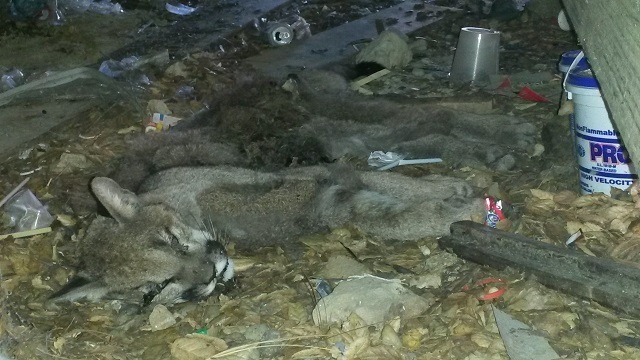 However, in the past two weeks, we encountered a couple of cases of puma deaths that are more unusual and may be indirectly due to human actions. We don’t know for sure that human activities led to the deaths of these animals, but similar cases have occurred in previous wildlife studies. Puma kitten dies under porch (photo by Chris Fust). The first case features a puma who crawled under someone’s porch and died there. This puma was young (around a year old) and possibly orphaned or separated from its mother. There were no signs of external injuries (from a fight or gunshot), but the puma probably died in relative distress if it crawled under a porch. One potential cause of its death is rodent poison. Rodent poison is commonly used by many households to control small mammals. In this case, a neighbor’s dog had been poisoned by rodenticide, so it is possible that this kitten also ingested some poisoned rats and succumbed to its effects. Although we won’t know the true cause of this kittens death until a necropsy’s performed, we do know that rodenticide poisoning negatively impacts numerous native species, including hawks, bobcats, coyotes, and mountain lions, as well as domestic cats and dogs. As top predators ingest poisoned rodents, the poisons accumulate in their body and slowly kill them. If you’re interested in more environmentally and pet friendly alternatives to rodenticides, the National Park Service has a page on it here. 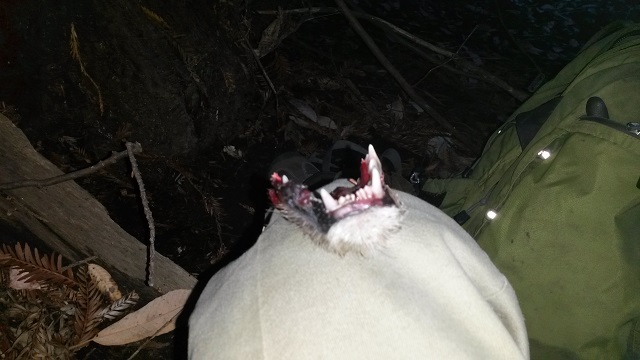 44M’s mandible after he is killed (photo by Chris Fust). Last week, we also found out that 23F’s new kittens, 44M and 45M, were recently killed (most likely by a male puma). Although sad, this was not an unexpected event. As you might remember, their father 27M was recently shot for killing livestock. Because he’s a territorial male, one of 27M’s duties was patrolling his territory, which includes 23F’s nursery and den area, for unknown males. When new males come in, it benefits them to kill cubs and free the female puma to breed again. Resident males are basically the only protection kittens have from this fate since their moms are not strong enough to protect them. Even if 27M were still alive, it’s possible his kittens would have been killed anyway, but his death certainly increased the odds. Although the direct threats humans pose to pumas and other wildlife have obvious consequences, indirect threats often go unseen. When one puma is killed, the effects can resonate though the rest of the population, like what possibly happened with 44M and 45M. However, we are equally capable of providing indirect benefits to wildlife through our actions by conserving habitat, using environmentally-friendly pest-control methods and protecting our domestic animals and plants.